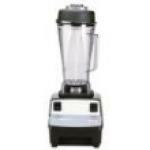 When shopping for a blender, there are a lot of important considerations to keep in mind — even details that are seemingly small at first, like motor strength and materials. Small things tend to add up into big problems if a lot of them are overlooked. Fortunately, we’re here to help with that. First, decide on the type of blender you want. The most traditional kind is a countertop blender, staying true to the designs of decades past. 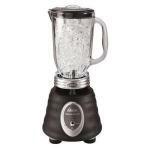 Countertop blenders usually come with a large variety of speed settings, everything from “pulse” to “liquefy.” Some models also have an ice crusher option for making smoothies or daiquiris. Another type is an immersion blender. This handheld stick-shaped appliance is like having a rotating blade on the end of your mixing spoon. 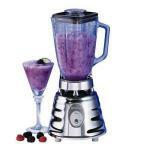 It can whip up smoothies in the glass, puree cooked vegetables, or mix sauces for a smoother texture. 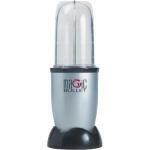 Some companies also sell “duet” sets including both blender and food processor. It’s a space-saving alternative to having two countertop appliances taking up space in your kitchen, since both the blender and food processor jars can use the same base. 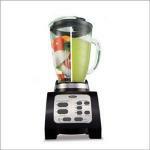 Above all, one of the most important qualities in a blender is its motor strength. 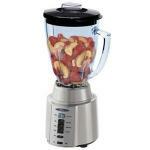 Even if you plan on using a blender once every few months, that won’t stop a weak blender from sputtering out when trying to tackle a heavy task. 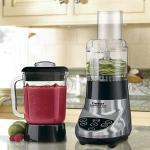 A stronger motor extends the life of your blender, saving you money in the long run. Look for one that’s 500 watts or more. Blender jars are usually made out of one of two materials: plastic or glass. Glass jars are more durable and have the added advantage of being BPA-free, but plastic jars are more lightweight, easier to handle, and you don’t have to worry as much about it shattering if dropped. Both are typically dishwasher safe. 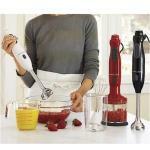 Immersion blenders come in corded or cordless models. The corded models have access to more power for a longer period of time, but a cordless immersion blender is much more versatile. For a workhorse that does it all, take a look at the Vita-Mix TurboBlend. It has a strong polycarbonate jar, stainless steel blades, and a motor over 2 horsepower that’s thermally protected to prevent overheating. 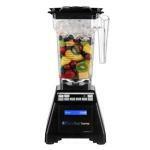 Another option is the Blendtec Professional’s Choice blender, a digital machine that is powerful enough to work as both blender and juicer — especially for greens. 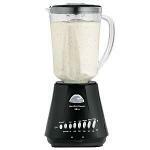 A less expensive option in the “mid-range” category is the KitchenAid 5 Speed Chrome Blender. It’s not equally strong as a Vita-Mix, but 700 watts still holds up to most blending tasks, including an option for crushing ice. And for a quality budget blender, the Oster Beehive is the way to go. This one gets consistently high reviews for a surprisingly steady functionality for the price. The Beehive has a polycarbonate jar, ice crusher, and a heavy base — which you’d miss if it wasn’t there. Ever had to hold a blender together for fear of it rocking out of its base? Won’t happen here. There are three immersion blenders that we like, all for varying yet equally significant reasons. First is the KitchenAid Immersion Blender, great for all its attachments (electric whisk, food processor, chopper blade, and mixing beaker cup). Next is the Dualit Immersion Blender with a handy “Turbo Pulse” button. And last but certainly not least is the Cuisinart SmartStick, packing a lot of power into a rechargeable cordless model. I am definitely into health food without the health food price. If you've walked through that specialty section in your local grocery recently, you know exactly what I mean. You'd think not adding preservatives and sugar was costly from a manufacturing standpoint. 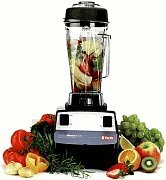 The Vita-Mix TurboBlend is exceptional because of the commercial quality blade and motor design. The heavy duty motor provides 2+ peak horsepower operated by a two speed control. The motor is thermally protected. This machine actually pulls in ingredients for smooth, uniform blending. The unit comes with a five year warranty. The Dualit comes in several styles; this model is in chrome. 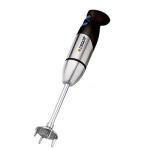 Its five hundred watt immersion blender offers variable speeds from nine thousand to sixteen thousand rpms and pulses at seventeen thousand rpms. There's good reason to call this Blender Mixing System magic. It seems to do everything. Only as big as a coffee mug, this do-it-all wonder replaces the blender, food processor, and coffee grinder. Sounds like a dream come true, right?